Around 10,000 people are diagnosed with bladder cancer every year in the UK. While the condition can potentially affect anyone, it’s far more common in people aged 60-plus, and men tend to be more at risk than women. You might think that the signs and symptoms of this type of cancer would be easy to spot, but experts warn that they can often be missed or mistaken for something less serious. That’s why it’s vital for everyone to be clued up about the disease and its possible symptoms, so any warning signs can be picked up and investigated early. All parts of the body can potentially develop cancer, including the bladder – the muscular sac, approximately the size and shape of a pear, that’s nestled in the pelvis, which receives urine from the kidneys and holds it until you need to go to the toilet. The first, Malde explains, is ‘non-muscle-invasive’ cancer. This is the most common type of bladder cancer. The second, ‘muscle-invasive’ cancer, is less common but has a higher chance of spreading to other parts of the body if caught late. If the cancerous cells spread to other parts of the body, it’s known as ‘advanced’ or ‘metastatic bladder’ cancer. 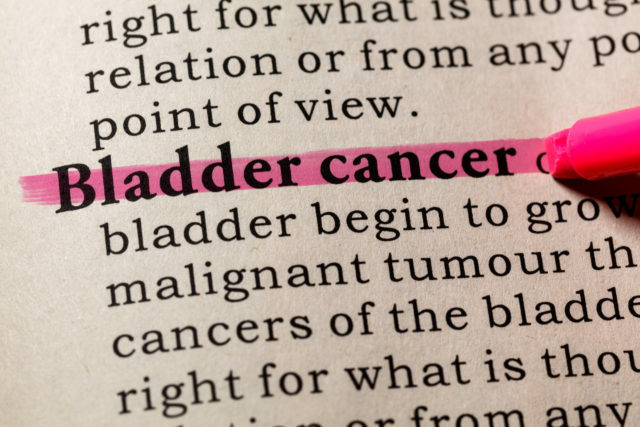 Bladder cancer is caused by abnormal changes to the cells of the bladder. Experts are unsure of exactly why this happens to certain people and not others – which is the case with many cancers – but there are some correlations between lifestyle factors and developing the disease. Malde explains that approximately one in three bladder cancer cases are linked to smoking, due to carcinogenic chemicals in tobacco passing through the bloodstream and into the urine which is stored in the bladder. Exposure to certain industrial chemicals, such as aniline dyes, benzidine and xenylamine, is also thought to be linked to a higher rates of bladder cancer. People who work in manufacturing and industrial jobs involving dyes, textiles, paints, plastics and rubber could be at increased risk. It’s important to remember that seeing blood in your urine isn’t always a sign of cancer – this can also be caused by very common and easily treated things, like infections – but blood in the urine is also the most common symptom of bladder cancer, so it’s always best to get it checked immediately. Don’t be tempted to self-diagnose. Book a GP appointment and get it checked out. Some other signs of bladder cancer, which are less common but still easy to monitor, include a need to urinate on a more frequent basis, sudden urges to urinate, a burning sensation when passing urine, pelvic pain, unintentional weight loss and swelling of the legs. Malde says: “In the first instance, patients will be tested for bladder cancer through a ‘urinalysis’ – a test which looks for abnormalities in the urine which could be a sign of bladder cancer, such as blood. “If abnormalities are identified in the urine, patients will then undergo a ‘cystoscopy’ procedure, which looks inside the bladder for abnormalities, or a cancerous tumour, using a thin camera called a cystoscope.” This procedure only lasts around fifteen minutes and is relatively pain-free. The treatment options for bladder cancer will largely depend on how advanced the cancer is. Generally speaking, as with most cancers, bladder cancer is far easier to treat if detected in its early stages – which is why awareness is so key. Not everybody with bladder cancer will need to have their bladder removed, but if the cancer has progressed to the muscle-invasive stage, this is sometimes necessary.